Sunday- “no-blog” day! I’ll either not post anything, or if I’m feeling groovy I’ll write a little something random, probably from a prompt! Tuesday- Tutorial Tuesday! I’ll either post a picture tutorial or video tutorial that I’ve made concerning makeup, hair, fashion-etc. If I somehow don’t have time to make a tutorial, I’ll post one of my favorite tutorials! Wednesday- College Fashion! This is a series I’ve somewhat started.. for Wednesday’s I’ll talk about what trends and fashions I’ve seen on campus throughout the week. Thursday- Rando! Basically this is what it suggests-something random!! Friday- Friday I’m in Love! By Friday we’re usually all pretty tired and ready for the weekend, so on Friday’s I’ll try to post something interesting, fun, and lovely to look at! It might even be some fun ideas for the weekend, something to wear for the weekend, or just pretty pictures! Basically anything that I think is interesting and that you might want to know about! Saturday- What I did today! On Saturdays I usually craft, shop, or both! Whatever I do (if it’s interesting, that is!) I’l try to post about it! SOOOOOO all these days are subject to be Randos, if I can’t seem to blog about anything pertaining to the topics-but I’ll try to keep on schedule! If you want to see something different on my blog-pretty PLEASE let me know!! Now, onto Fun Friday! For this Friday, I’d like to do something I call Store Spotlight! The first look I created was borrowed from the boys-one of my favorite things to do right now, since it’s a little cold and sometimes my jackets just don’t cut it! For the “Lynard” look, first-go looking around the mens department (kind of scary, right? Don’t tell anyone my secret-but I like to pretend that I’m looking to buy something for my boyfriend, so no weird stares are involved!). But grab this faded denim button up from the guys, and layer it on top of the dark grey Lynard Skynard t-shirt (also borrowed from the boys! ), then go back to womens-and look for the totally rad washed out skinny jeans. If you’re feeling spontaneous, maybe tuck in half of your tshirt for a laid back, cool vibe. 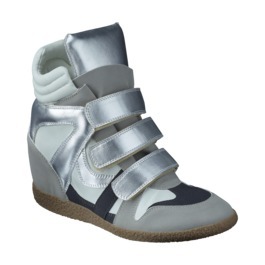 Then head over to shoes and get the totally on-trend sneaker-wedge in a grey/silver blend. 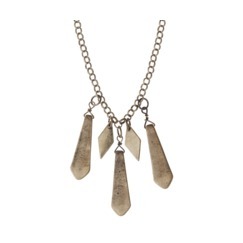 Then look in the jewelry for this great layering necklace, then bam-DONE! To make this outfit really “yours”, layer some of your own cool necklaces over this Target one. This outfit is super laid back, edgy, and chill-all at the same time! The “Mrs. Cool” look is definitely polished, but also trendy too. With this outfit, the yellow cardigan, white/gold dotted shirt, black flowy skirt with brown belt, grey/blue satchel, and coral heel tipped with gold are needed. 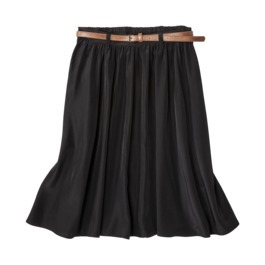 To style this outfit, first-tuck in the white shirt to the black skirt. Then layer on the yellow cardigan and scrunch up the sleeves, then roll the white shirt’s sleeve over the cardigan. 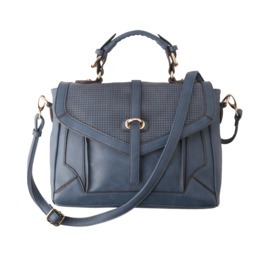 Then simply put on the heels and stock your bag-done! I love this outfit because it’s polished enough to wear to maybe a formal work setting, but casual enough to wear everyday. And I think it’s definitely on-trend because of the shoes-HOW cute are they?? The coral mixed with black and yellow will really make a statement! Just a warning though, I actually own the coral heels and they LOOK to be an easy 2 inch heel, but actually they feel like a 3 incher because there isn’t a platform. Other than that, this outfit is PERF! Sassy Lady is probably the favorite out of the 3. I feel like this outfit is for one of those days where the weather cant decide if it’s hot or cold! Those days are SUPER annoying, but with this outfit-you’ll be wishing for some more! Top off this cute little number with a grey, slouchy beanie. The beanie will give the skirt a more casual feel. Then go with the white/navy striped sweater, then grab the orange mesh skirt. In my opinion, leaving the sweater un-tucked gives the outfit more of a casual feel, which to me looks best. 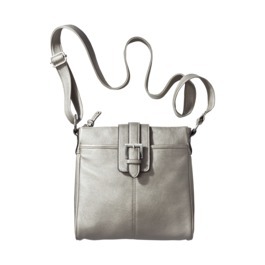 Then use this super stylish metallic grey bag to store your lipgloss, then put on some grey argyle socks (for warmth-but also style!) 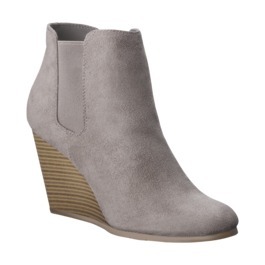 and scrunch them down to look like leg-warmers, then put on these grey wedge booties-FAB! I hope you enjoyed this Store Spotlight on Target! Again, all the items shown can be found at Target.com or in stores! If you’re interested in some more Target looks, check out one of my FAVORITE Tumblr-Target does it again! They also have an instagram feed you can follow for awesome pics! Last but not least-Glitter Loves Haute Couture was featured on one of my fav store’s blog! Here’s the link to see the post- http://www.shoptheelle.com/blogs/news/7193614-me-time, and here’s a link to The Elle’s store, and they’re also on Facebook-check them out! Have a great rest of the day and a FABULOUS weekend!!! Posted on January 18, 2013 January 18, 2013 by flancake13	This entry was posted in Friday I'm in Love. Bookmark the permalink. ← College Fashion. Mens fashion-what to give your man advice about!